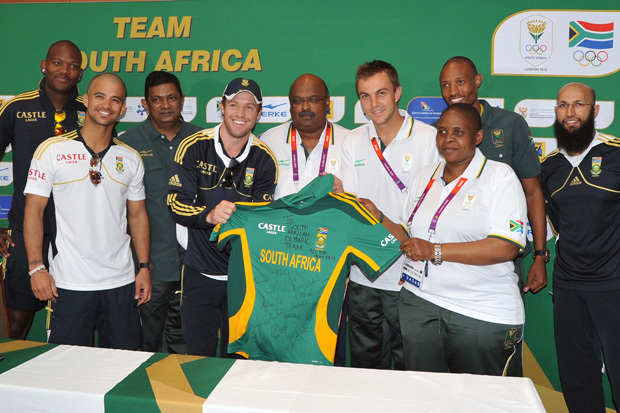 London – Proteas stars AB de Villiers and Hashim Amla paid a whistle-stop visit to the SA Olympic press conference in Kensington in London on Wednesday to wish Team SA well ahead of the 2012 Games starting on Friday. De Villiers and Amla, along with fellow Proteas team-mates JP Duminy and Lonwabo Tsotsobe urged Team SA to “make South Africa proud”. With Test skipper Graeme Smith back in SA celebrating the birth of his daughter, De Villiers handed over a signed Proteas jersey to athletes LJ van Zyl and Beijing long jump silver medallist Khotso Mokoena. The Proteas, coming off an innings and 12-run victory in the first Test against England at the Oval last week, start the second Test at Headingley in Leeds on Thursday, August 2.